I recently volunteered with Collide, a non-profit organization in New York City that supports homeless or transient people who have pets. The experience shed light on an invisible and under-served segment of the pet-keeping community. 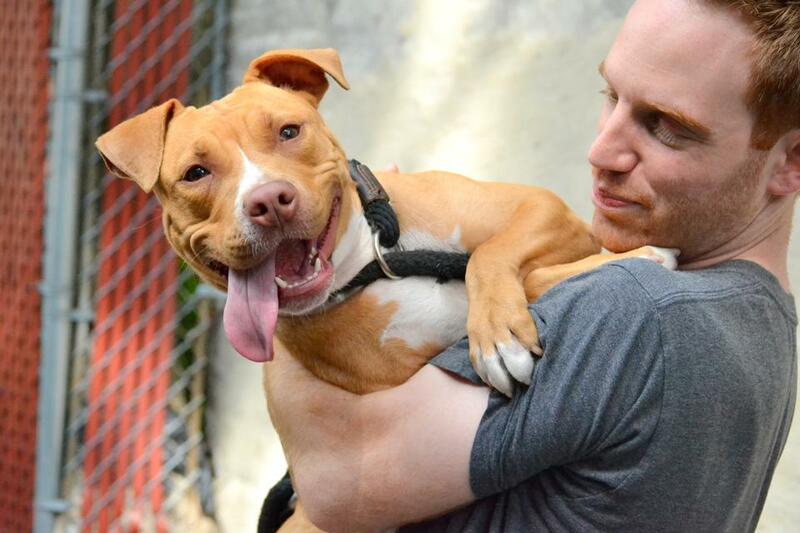 Jeff Latzer, a New York City resident and animal welfare advocate, has also volunteered with Collide. I asked him to write about his experiences and how they’ve influenced his views on animal welfare, the human-canine bond, and the “bigger picture” of helping people and their pets. After seven-plus years in the animal shelter and rescue world, I figured I had a basic understanding of homeless pets in New York City. 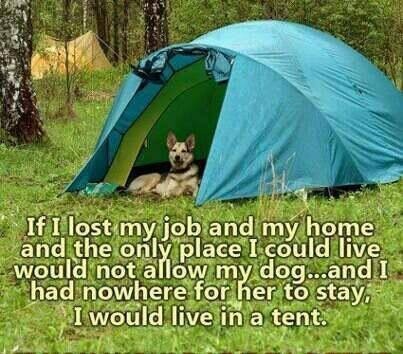 I knew what it took to care and advocate for shelter animals, to foster dogs, and to place them in loving homes. Recently I began volunteering with a community outreach organization called Collide, on Manhattan’s Lower East Side. I’ve begun to realize how complicated the human-pet relationship really is, and how easy it can be to forget the human aspect to that equation when operating in the world of animal rescue. To a certain extent, animal rescue functions with a set of institutional blinders, where impassioned armies of people proudly advocate, care for and devote their time and money to removing homeless pets from shelters, ideally providing medical care and training, and then finding homes through careful screening processes. My peers and I in this community saw humans as the source of most animal problems in the world, so the focus was always on putting the animals first, making many decisions based on what was perceived to be in their four-legged best interests. Most animal rescue equations begin at the shelter: it is the dropping point for stray animals, as well as the destination of last resort for struggling families. 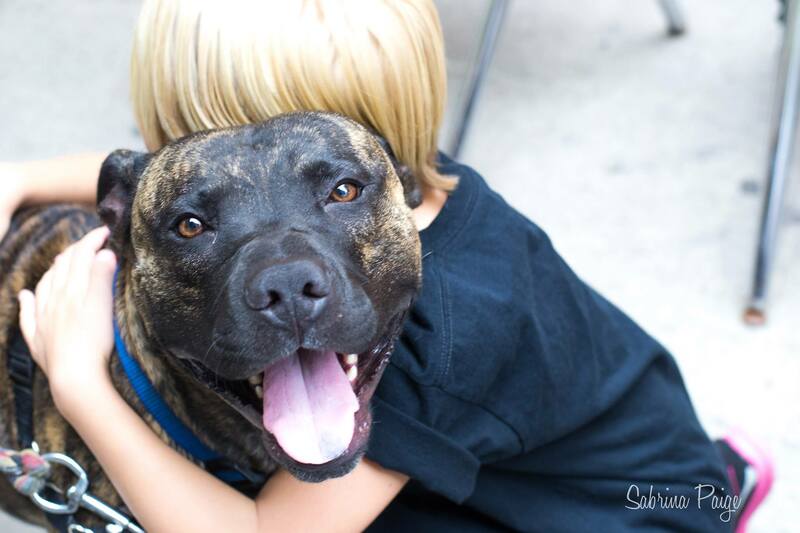 At the shelter in Harlem, where I volunteered for three and a half years, we were inundated on a daily and nightly basis with dogs and cats, many from owners who, for a variety of reasons we rarely heard details about, thought they were out of options. Over time, many volunteers at shelters like Animal Care & Control (AC&C) in NYC develop an extremely bleak view of humans, and how poorly many of them appear to treat their animals. When owners surrender their pets at AC&C, many do so after exhausting all other options, and then standing for hours in an endless line of misery in the shelter’s front lobby. When most shelter volunteers and employees think of the queue of ‘owner surrenders’, it is with scorn and disgust, and this is colored through what one might call the “loudest” cases. The personal stories you tend to hear about in the shelter (or on the periphery — that is, in the online rescue community) are the gruesome cases of neglect, cruelty and mistreatment. And in fact, it’s fair to say that a significant portion of my time volunteering at AC&C was spent caring for the most victimized creatures who happened to be in the shelter at any moment. A lot of volunteers I partnered with operated in this triage manner: an attempt to devote time and caring to every animal, but making sure the worst cases received an overwhelming amount of support. As a result, these “loudest” cases ended up blanketing a dark perception of innocent members of the public, many of whom are actually pet lovers in need of a triage of support themselves. By assuming the issues are all black and white, and that those who would dare to consider surrendering their pets are therefore bad pet owners, what we’ve really done is criminalized the act of being poor, and stamped each and every person of limited means as uncaring, even abusive toward their pets. By labeling an entire group of people whom we don’t know personally as “bad pet owners”, we fail to realize that many of these desperate people simply need access to affordable resources. 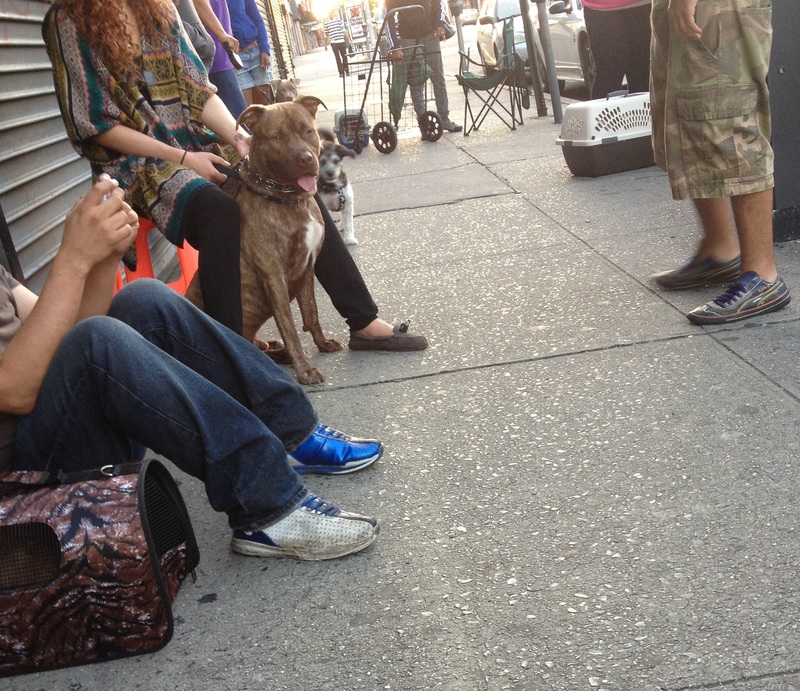 Starting at 5:00 am, New Yorkers form a line to access low-cost spay/neuter services for their pets. Keeping pets healthy in NYC on a limited budget can be an extremely difficult task. 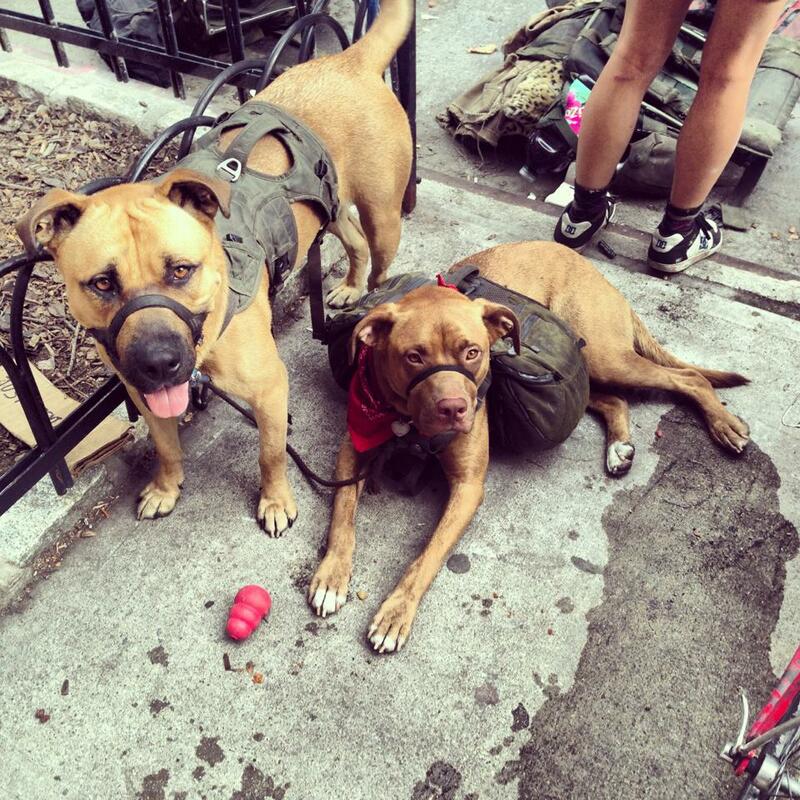 There are vast swaths of the city which are simply inaccessible to affordable vet care. Even people who live in public housing will have a hard time finding care they can afford to simply meet the NYC Housing Authority (NYCHA) pet requirements. For example, NYCHA requires all pets be spayed or neutered. Such a mandate may sound idealistic on paper, but unless NYCHA turns around and provides low-cost spay/neuter, they are simply antagonizing their tenants, pushing scores of people to surrender their pets due to services that are out of their reach due to finances or proximity. (In a nutshell, that is also the fatal flaw of all mandatory spay/neuter laws.) While to many people a simple spay/neuter for their new pet is second nature, to someone on a limited budget in an underserved community, it can be a Kafkaesuque game of Cronuts, as Kim Wolf recently investigated. This is a difficult paradigm to grasp when working inside the bubble. Over the years, my rescue friends and I have often been asked why we devote ourselves to helping animals, and not people. I always found this an awkward question to answer, but never really gave that awkwardness much thought. I was usually vague, mumbling that there are lots of people who help people, but animals need help too. The real answer behind that awkwardness is that the two should not be mutually exclusive. My friend Sabrina Paige introduced me to Collide, a grassroots program run out of the Graffiti Church on the Lower East Side by the heroic Heidi Powers. 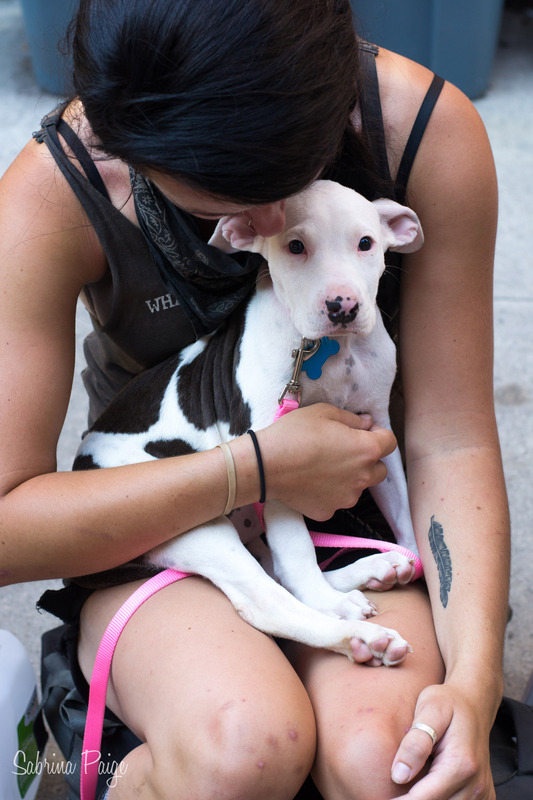 Heidi and a small group of employees and volunteers help homeless people, with a particular focus on providing food and medical care to the companion animals of New York’s transient population. 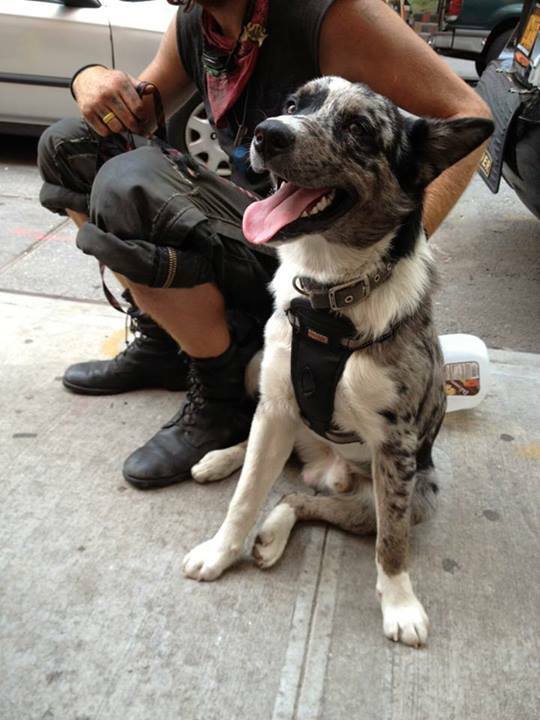 The majority of homeless outreach in NYC focuses on the person; if you are one of those people, and you happen to have a dog to whom you are utterly devoted, you will be turned away from homeless shelters and soup kitchens, nearly all of which prohibit pets. As a result, the simple act of dinner becomes a great challenge. Collide caters to these needs by feeding the people and their pets together, in a sidewalk picnic outside of the Graffiti Church on East 7th Street. They also provide crucial vet care including spay/neuter, vaccinations and medicine at regular clinics. If you imagine for a second how disenfranchised many New Yorkers are in finding access to affordable vet care, that problem becomes exponentially harder for the homeless: without any proof of address, they will be turned away from most low-cost pet health services, should they succeed in finding them without a means of transportation. Conversely, when people get their animals fixed at Collide, they receive priceless supplies (referred to as a Call of the Wild kit) as an added incentive. 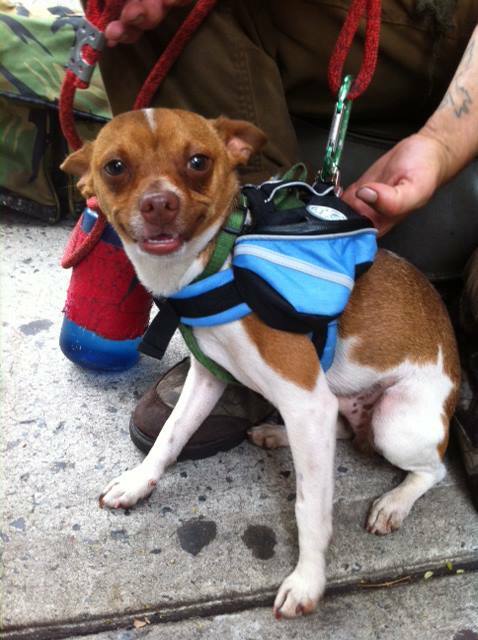 The kit includes a canine backpack, flashlight, carabiner, and new collar and leash. Within a few minutes of serving warm meals and filling water bowls at a Collide dinner, I began to realize that the idea of any correlation between material possessions and devotion to a pet simply does not exist. One man named David (names have been changed for privacy) sat eating pasta and meatballs with his pit-mix politely eating kibble at his side. David is my age, and his dog the same age as my current foster. Apropos of nothing really, David succinctly took a bunch of animal welfare paradigms and effortlessly spun them like tops on the sidewalk in front of us. Sabrina and I exchanged pained glances. David had tapped into one of the more skull-thumping ironies that we witness in rescue: many animal rescuers and their supporters will proudly proclaim that when “push comes to shove” they would “live on the street” with their animal, rather than bring them to an animal shelter. And yet those are the same people who will turn around and attempt to steal the dogs of homeless people, “to give them a better life.” We’ve occasionally watched in horror as these latter rescue scenarios are proudly posted on social media. It is 2013 and more than 50,000 New Yorkers are forced to sleep on the streets every night, with shelter populations increasing 61% during the Bloomberg years. Since homeless pet owners are turned away from NYC shelters, what is already a desperate and dangerous situation becomes particularly dire and lonely. The threat of violence is ever-present, as is the need for self-protection. Imagine carrying all your possessions –valuables and otherwise — on you at all times. Your dog will become the only way to fend off rats or other small animals from eating your possessions at night, a danger that had not occurred to me during my childhood years of camping in a tent. Now imagine that you also have to worry that your closest friend in life, the four-legged slobbery boy whose wet nose burrows into your sleeping bag every night, is also at risk of being kidnapped by overzealous rescue warriors who have decided that you’re not fit to care for him, and that the best course of action is recording a heroic rescue mission for their friends to share gleefully on Facebook. A man named Alan sat in a folding chair, with his large panting brindle dog sitting proudly on top of two gargantuan camping backpacks. I asked if I could pet her, and Alan said, “Sure, you can pet Abigail, right girl?” and gave her a head pat. He then looked back at me and offered, “You can always pet her when I’m here. But if I walk away, even to grab a fork at that picnic table, then don’t go near Abigail. That stuff,” he said, nodding at the backpacks, “is all I got. So she doesn’t let anyone near them unless I’m here. That’s your job, right Abigail? Good girl.” She nudged Alan’s knee, rolling onto her back at his feet as he smiled and finished his dinner. Some of the stories people at Collide tell me about things that have happened to them in the past week are worse than anything that has happened to me my whole life — but none of it was out of the ordinary for them. It made me realize how little we consider about those suffering from extreme poverty. Have you ever experienced true desperation, where you really stood to lose everything and had to make life and death decisions? While I have not, you can bet that many of those people waiting to surrender their pets at AC&C most certainly have. It is a conundrum that few people really think out in literal terms: in a time of true hardship, when faced with a choice of securing a safe place for your family to stay (which almost never includes pets) versus living on the street in NYC and immediately having to defend yourself and loved ones against physical and sexual violence — what exactly would you do? It is no secret that humans have a greater ability for compassion toward animals than toward other people. This disturbing reality is rarely more evident than at Collide, where donations of premium pet food are plentiful, but the other side of the scale — resources for their human guardians — remains nearly empty. While there are many generous grant-related programs that Collide works with for pet care and food, it is exponentially more difficult for them to find in-kind grants to help the pet owners themselves. Collide kids (or “the traveling youth”, as David referred to his peers) will often come to meetings and empty their backpacks of pricey canned pet food that strangers have given them. It must be especially surreal to be hungry on the street and only given food for your dog, or even worse — to have someone offer to take your beloved dog from you, thinking they’re being helpful. There is a frighteningly widespread assumption that homeless people keep dogs to bait passersby into feeling sympathy for them. While it’s certainly true that many New Yorkers won’t bat an eye at human suffering but would definitely notice a cute dog panting, this logic does not work both ways. Many people who live on the street had their dog when they lost their home, and would never consider parting with a family member. Others acquire pets on the street for love and companionship — in other words, for the same reasons we all acquire pets. But regardless of the source of their pet, transient New Yorkers must work extra hard to keep their pets healthy, as taking on another dependent mouth to feed is no small matter — and no one takes these responsibilities more seriously than the people I’ve met at Collide. Going back to David’s point, the human-canine bond is something that most of us experience as a hobby, or from a purely social perspective. Our dogs are our best friends, and we mainly rely on them as our playmates. Some of us have working dogs who perform tasks, like service or police dogs. But there is something different, in a way, in the relationships some people at Collide have with their dogs, than anything I’m really used to. They are pet owners who choose to live harder lives, with less access to aid and shelter, in order to keep their animals. Whether the location is NYCHA public housing or a city park bench, poverty is hurting tens of thousands of New Yorkers and their pets. Instead of blaming or ignoring our struggling pet-owning peers, we owe it to them and the animals who love them to improve access to vital resources, and raise the quality of life for all species in this city. Thank you, Jeff, for being a compassionate voice for the invisible New Yorkers, both human and canine.